This episode covers the Web 2.0 events in San Francisco and Berlin. I have some additional footage of Life Before, Life After, which will be used for a future episode. The Code and Tunes segment shows a demonstration of how to connect Flex to ColdFusion using the Wizard and AMF RemoteObject. A personal plea: Lance Armstrong (7 time Tour de France winner) has the Lance Armstrong Foundation as a legacy to raise money to fight cancer. If you enjoy this episode, please visit LiveStrong and make a contribution to help fight cancer. Lance donated his time and energy to come and talk at the Web 2.0 event in San Francisco and I want to encourage everyone to give back to this important cause. Flash Search Engine Optimization - Ichabod works! Traditionally, accessing text from Adobe Flash (R) files has been difficult. When a SWF has different states, only one state may be initialized (in memory) at any time during the execution of the SWF. The ability to detect other states and change state, then grab text from different states is demonstrated in this video. This demo is run on Ubuntu Linux. Anyone interested in Flash SEO should take a close look at the output of the terminal. This shows exactly what was encountered for the given application. The API is not public nor is it known how Google will utilize SWF text content or weigh it against HTML text. Both of these are obviously secret for a good reason. I am still running tests on earlier flash SEO posts and will likely have some Flash SEO tips within 6 weeks. It took longer than expected for Google to index the newly created data (had to keep checking the log files) and the bot has not reached very far into the SWF so far. Adobe Cloud Computing - LiveCycle ES Cloud instances! 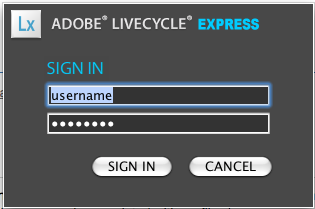 In case you missed the big news on January 12, Adobe is now offering Adobe LiveCycle ES Developer Express. This is Adobe's first (but not last) major foray into the world of enterprise cloud computing. The LC ES Developer Express software is a full version of Adobe LiveCycle ES that is hosted in the Amazon Web Services cloud computing environment and provides a virtual, self-contained development environment where enterprise developers can prototype, develop, and test LiveCycle applications (*.lca files). 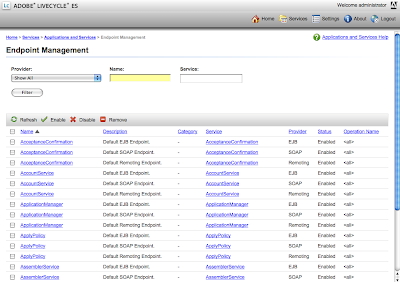 Provides pre-installed, pre-configured virtual instances of LiveCycle ES. Reduce time required to download, install, and boot new server instances. Develop LC ES applications in a fraction of the time. Once you get an instance up and running, it appears to be virtually running on localhost:8080. 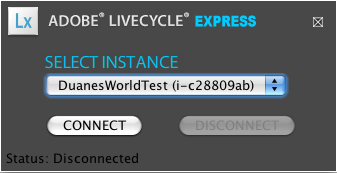 There is a small download called LiveCycle Developer Express (shown below), which then allows you to log in to the instance running in the cloud. and hit "Connect". Once you connect, you will be able to log in by accessing the admin panel via a browser. The URL is http://localhost:8080/adminui/secured/admin.faces. Note below that I am now logged in as Admin while running it in the cloud from my Mac. What does this mean? LC ES on the Mac!!! The service, available to all members of the Adobe Enterprise Developer Program, allows developers to bullet-proof their applications without having to invest in a development environment or test lab. I will be unveiling more on a future episode of Duane's World when we get into SOA and ESB cloud architecture. Due to repeated posts on this topic on the Google LiveCycle Developers list, I am posting this technical bulletin in its entirety on my blog to help inform people. Out Of Memory (OOM) errors occur on an Adobe LiveCycle ES Update 1 JBoss turnkey installation. This issue is related to the MySQL JDBC driver version and the data source connection settings. Caution: This update is strongly recommended. You must obtain and install version 5.1.6 of the JDBC driver to reduce the number of open result sets and resolve the out of memory issues. You must also change the data source and JVM settings. Obtain version 5.1.6 of the JDBC driver from the MySQL site by downloading the driver distribution kit mysql-connector-java-5.1.6.zip. Unzip the archive file and locate the mysql-connector-java-5.1.6-bin.jar file. Copy the mysql-connsctor-java-5.1.6-bin.jar file to the [JBoss_root]\server\all\lib directory. Locate the line 10 and change the value from 10 to 1. Note: Modify this value for both the IDP_DS and the EDC_DS definitions. In the IDP_DS definition, locate and change the value to 20. In the EDC_DS definition, locate and change the value to 10. For both IDP_DS and EDC_DS definitions, locate and change both values to 20. Music 2.0 takes huge leap forward! MixMatchMusic just announced it has acquired Mix2r, a web app that enables electronica artists to upload their music for remixing and for creating derivative works by other electronica artists, fans and music enthusiasts. Mix2r's community of musicians, DJs and fans features more than 6200 songs and music stems. MixMatchMusic also has a ton of online tools for remixing and widgets for remix contests. "MixMatchMusic's combination with Mix2r adds a lot of dynamic new music to our library and brings us closer to the critical mass of stems and community needed to fuel our next stage of growth," said Charles Feinn, MixMatchMusic co-founder and CEO. Both the Mix2r and MixMatchMusic sites use or will use Adobe® Flash® Platform technologies including Adobe Flash, Flex and Adobe® AIR™. These technologies will be used to create future versions of the combined site. Emerging and indie artists win as a result of this combination. The breadth and depth of content and the number of people contributing to it adds energy and creativity to the community, and that in turn will attract more people and more great music. This is big news for both Mix2r and MixMatchMusic and I look forward to seeing what the combined companies will provide. Congrats to both!